Framed flip-up top displays full-year reference calendar card, which may be replaced by a 4 x 6 photo. 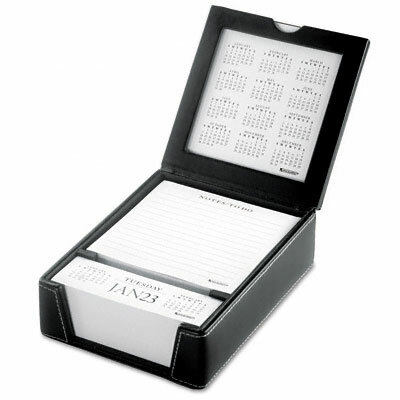 Open or closed, daily calendar with current and next month's reference is always in view. Opened box reveals a self-stick lined 4 x 4 pad with 375 sheets for jotting down notes. Attractive cream contrast stitching accents black box. Framed flip-up top displays full-year reference calendar card, which may be replaced by a 4 x 6 photo. Open or closed, daily calendar with current and next month's reference is always in view. Opened box reveals a self-stick lined 4 x 4 pad with 375 sheets for jotting down notes. Attractive cream contrast stitching accents black box.